Irish poet and dramatist, William Butler Yeats (1865-1939) was born in Sandycove, Dublin on 13 June 1865, the son of John Butler Yeats, barrister turned portrait painter, and Susan Pollexfen, daughter of a wealthy mills and shipping Sligo family. 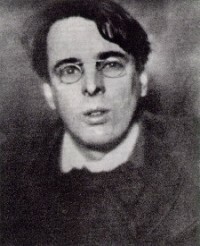 Yeats’ early years were spent between Dublin, London and Sligo, attending school in Dublin and London before entering the Metropolitan School of Art. He began to write poetry in his teens with his father’s enthusiastic encouragement that include The Song of Wandering Aengus, Down By The Sully Garden and The Fiddler of Dooney. Yeats was one of the great poets of the twentieth century who created works that are universally known and loved, and that have exerted a profound influence on world literature. The National Library of Ireland holds the largest collection of Yeats manuscripts in the world and, in addition, holds other fascinating Yeats material generously donated by the poet’s family over the years. The National Library of Ireland in association with Poetry Ireland organised the YEATS ALOUD Spoken Poetry Competition for post-primary school students. The competition was to coincide with the National Library’s first major exhibition that was officially launched on 25 May 2006 by the Minister of Arts, Sport and Tourism in the presence, amongst others, of Michael Yeats, son of the poet. The largest ever exhibition on the life and works of William ButlerYeats includes manuscript drafts of many of his greatest and best known poems such as Sailing to Byzantium and Among School Children, and the first edition in pamphlet form of Easter 1916. The exhibition also displays Yeats family treasures on temporary loan, including an illuminated copy of the Lake Isle of Innisfree, printed by Elizabeth Yeats and portraits of George Yeats, his wife, by Edmund Dulac and John Butler Yeats. The exhibition covers many aspects of the poet’s life and his development as a writer, while giving an insight into Irish social, cultural and political life from the late 1800s to the 1930s. New visual and sound technology provides extra dimension to the displays. In a unique event, four plays were performed in November 2006 at the National Library by the Dublin Lyric Players. Collectively known as the Cuchulain Cycle, they were written between 1900 and 1939 and are described by the series’ director as ‘masterpieces of the English-speaking theatre, containing some of the most beautifully wrought poetic language … The plays’ themes are similar to those which dominate Yeats’ poetry: the purpose of life and death, the significance of beauty and love, the place of action and commitment, heroism and idealism, in human destiny’. In 1904 William Butler Yeats founded the Abbey Theatre, Dublin, for which he wrote many plays. He was a senator of the Irish Free State 1922-28, and was awarded the Nobel Prize for Literature in 1923. He died in Roquebrune, South of France, survived by his wife and two children, Anne and Michael Yeats. His remains were brought to Drumcliff, Co. Sligo, in 1948. The poignant occasion is on film at the special exhibition at the National Library Yeats: life and work of William Butler Yeats. Note: Acknowedgement is given to all sources of information used in preparation of this text.